As fall classes get under way at SUNY Oswego, the college has greeted the most diverse class of new freshmen in its history. A record year for applications at Oswego -- more than 11,700 -- produced a Class of 2021 of nearly 1,500 students, the fifth straight year freshmen enrollments have topped 1,400, based on preliminary figures from Dan Griffin, director of admissions. SUNY Oswego has increased the number of freshmen from traditionally underrepresented groups each year since 2010, moving throughout the decade to recruit a more diverse student body and to make the campus welcome to all, regardless of race, ethnicity, culture, socioeconomic background or any other perceived difference. Diverse students make up 34.3 percent -- 508 among the estimated total -- of the new freshman class. In 2010, diversity among freshmen stood at 19.4 percent, with 270 enrollees. "It’s more than just gathering applications," Griffin said. "Students have to come here and like what they see, and envision themselves as part of this community. For that to happen, they need to feel welcome, and we have to offer what they are seeking. It is important that this campus reflects society. And the numbers would indicate this is exactly what’s happening." Among other signposts in the enrollment numbers, the college's School of Education greeted more freshman majors -- an estimated 211 -- than it has any fall since 2010. As job prospects for new teacher candidates continue to improve, the school offers state-of-the art programs, classrooms and labs, even as the final stage of a project to reunite all six departments moves toward completion. "I think families want to feel their students are going to get a good job when they graduate," Griffin said. "People are more confident in education job prospects. The word is out that there is a need and, in some sectors, there's a teacher shortage coming." The Class of 2021 hails from far and wide, Griffin said, with continued strong Downstate enrollment and geographic diversity, though freshmen from Oswego and contiguous counties bounced back from last year's level. "It will be a very strong class again, with a rebound from Central New York enrollments. We are predicting (a final number) of about 325 freshmen from the region," Griffin said. Transfer applications -- more than 2,300 -- increased to the most since 2011. SUNY Oswego expected to greet about 730 new transfer students as classes got under way. Their numbers continue to increase in diversity, too, at 23.1 percent of the total transfer enrollments. Griffin pointed out that the college has redoubled its efforts to recruit student transfers. "Our transfer team has done a great job getting out to community colleges, hosting meetings, and clearly offering pathways to students to complete their degree here" he said. The college also provides encouragement to unsuccessful Oswego applicants who eventually want to complete their bachelor's degrees here. For example, students who aren't accepted as freshmen at Oswego may qualify for the college's Start Now program, which redirects prospective students to Jefferson Community College -- with plans to expand to other colleges -- to develop study skills in a structured and supportive environment, become successful at completing college-level work and earn credits that transfer into one of Oswego’s four-year programs. In the past 15 years, SUNY Oswego has invested $800 million in environmentally responsible construction on campus, and continues to make residential life attractive to new students. In the latest rejuvenation of a residence hall, Scales reopened in August as a $13.4 million fast-track renovation wound down after only eight months. All four lakeside residence halls and a dining center now have received makeovers; more are planned elsewhere among the college's 13 residential options. "At the end of the day, enrolling a successful class comes down to many things -- housing, academic offerings and facilities, financial aid. I'm proud we as a college have put ourselves in position to be ready for our excited new students," Griffin said. "This might be one of our best fall classes." 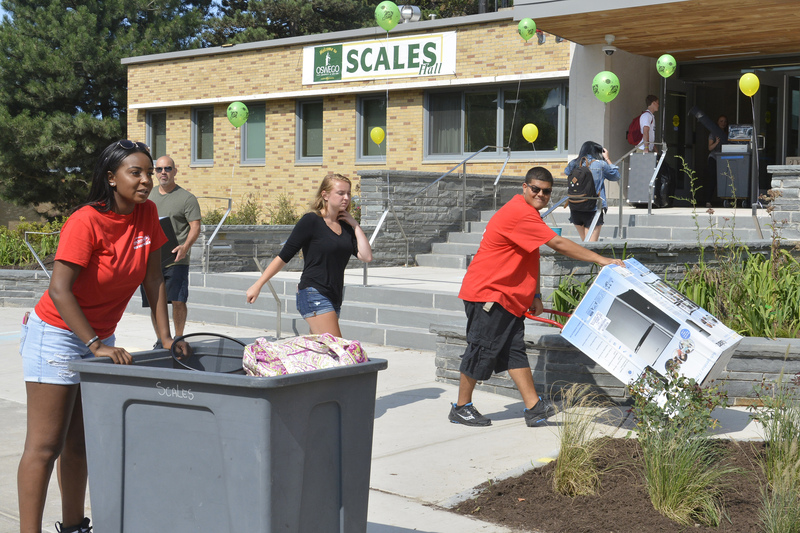 Red Carpet unfurls -- SUNY Oswego's Red Carpet team, including sophomore Xianna Cooper (foreground) and junior Sergio Valoy, give assists to new students moving into renovated and modernized Scales Hall. The college greeted its most culturally and ethnically diverse class ever for the Aug. 28 start of fall semester classes.